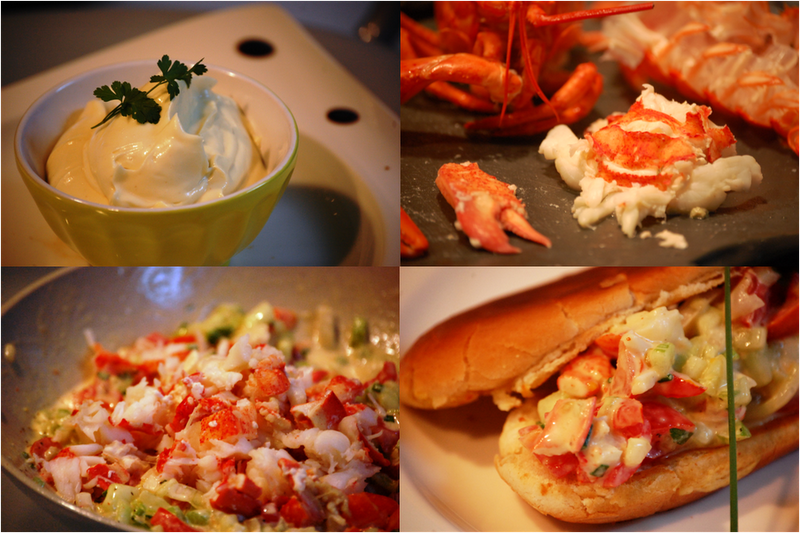 The Cooking Blog of Emilie French Chef: Turn your Lobster in a Roll !!! Turn your Lobster in a Roll !!! When I buy Lobster, my husband and I always debate: "grilled Lobster" or "boiled Lobster" ? You just need alive lobsters, veggies, herbs, mayonnaise and buns ... et voila ! I forgot, you also need to boil a Lobster alive and then to cut it ... don't be shy and give it a try, it is super easy !!! It is very easy, but this recipe will never be good if you dont open a bottle of chilly white wine !!! Place the whole egg, mustard, chopped garlic, salt and pepper, and 1/2 cup oil in a deep container. Blend with a hand soup mixer (always moving down to up) on high speed until the mixture starts to lose some of its yellow color and become a bit whiter and thicker. Then pour gradually the rest of the oil and add the garlic at the end, when the mayonnaise is thick. Keep blending until you get a very firm mayonnaise. You can add 1 tsp of vinegar if you prefer a bitter taste. Add more salt and pepper to taste. Bring the water to a boil during almost 20mn to get enough flavors. Add the live lobsters one at a time (don’t remove the rubber on their hands), and start timing immediately. Reduce the heat and do not let the water boil. Cover. Share the Lobster by half (cut them from lenghtwise, from the head to the tail), remove the meat from the tails and clawz and serve over Salad with Aioli Mayonnaise on the side. Chop all the vegetables in small pieces, add a few of salt and pepper and place everything in the same container for 2 hours. Use a cleaver to crack and remove all the meat from the claws, knuckles and tails. Remove all the carcasses and break the claws to get the meat inside. Cut all the meat in small pieces (leave biggest pieces for decoration). Combine the lobster, mayonnaise, and vegetable mixture with herbs. Stir gently and add salt and pepper to taste. Then butter your buns and toast them quickly in a pan (cast iron is the best) until golden brown.